The warm summer months tend to bring a lot of fashion stress into people’s lives. If women are not worried about whether or not they have a “bikini body” then both men and women are racing to try and keep up with the latest fashion trends. For women, the greatest wardrobe challenge they face is choosing the right party dress for the summer. There are few people who can afford to have a close full of perfect dresses for every kind of party. Most have to do the best to make one or two party dresses work no matter what the occasion. Summer parties are as stressful as the fashions required at them. The range of events is broad from barbecues to cookouts to boating to the beach to weddings and baby showers to name a few. But just because a party is called a cookout doesn’t mean that it is a shorts and flip flop affair. Each party will have its own etiquette. Even a cookout can be black tie. Something like a birthday party calls for a more neutral look. You can Buy Style We Dresses for Birthday Party and not be disappointed at all. What Makes a Dress a Party Dress? Dresses are a complicated form of fashion to read. On one end of the spectrum, there is the sundress and on the other, the evening dress. However, a sundress can also be considered an evening dress if it is made out of certain fabrics and accessorized correctly. So what makes a dress a party dress and not any other kind? Color and fabric is the key. something that is considered too casual to be a party dress will be of a more muted color and use a sturdier fabric – such as a heavy duck, cotton or even a terry cloth. A fancy dress will also be more restrained in color but will have finer fabrics used in its construction like silks. A party dress will be more brightly colored and use a lighter fabric than a casual dress but a sturdier cloth than a fancy dress. For example, a party dress will often be made out of rayon. Rayon looks fancy, is light and flowing in form, but stain resistant and does not require special cleaning. 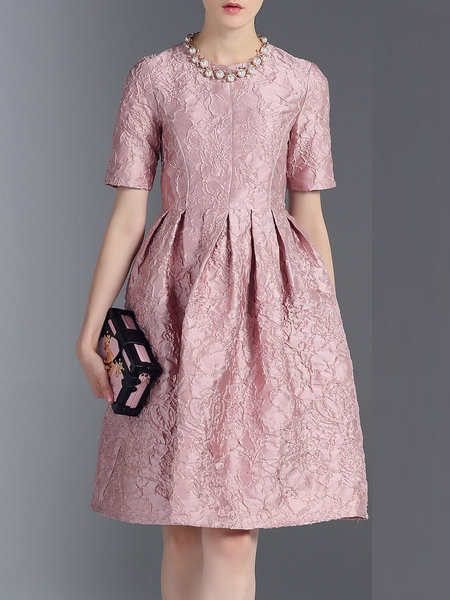 The party dress is designed to be noticed and to make a statement unlike the casual dress which is for comfort and the fancy style which is about communicating style and elegance. Is a Cocktail Dress Something Different? A cocktail dress is very different from a casual, fancy or party dress. A cocktail dress is almost an evening dress in its formality but the accessories worn with it make it less formal and more fun. Cocktail dresses are usually accessorized with costume jewelry. The dress itself is sleeker and subdued while the jewelry, bag and shoes are more fun than restrained. The cocktail dress is a very specific kind of party dress. It is sort of the “grown-up” version of the all-out party dress. How to tell what is an Appropriate Party Dress? Knowing which style of party dress is appropriate for a function will prevent awkwardness and embarrassment. It is rare that the style of dress will be spelled out on the invitation beyond the call for “casual, formal or evening dress.” So how do you tell? First, look at the location of the event. The more upscale the location the more upscale the style of the party dress. “Upscale” should be interpreted as restrained and restraint in the party dress means more conservative style in the actual dress but more flair in the accessories. Next, who is hosting the party? If they are close friends of yours then you can pretty much guess the dress code. Finally, what type of party is it? A themed party calls for a more put together presentation, a reception will be more formal and an outdoor event more relaxed.